Imagine being able to walk through Central Park, reach up into a tree, pick a ripe apple, and bite into it. No one readies their cell phone to call 911. No park rangers rush out of the bushes and tackle you. No one asks if you help water the tree on your days off. Nope, they just let you enjoy your free, crisp apple and continue on your day. It sounds like a far-fetched dream. But to Mary Mattingly, an NYC artist and activist, the idea that food should be a public, easily accessible resource is what drove her to create her newest project: Swale. 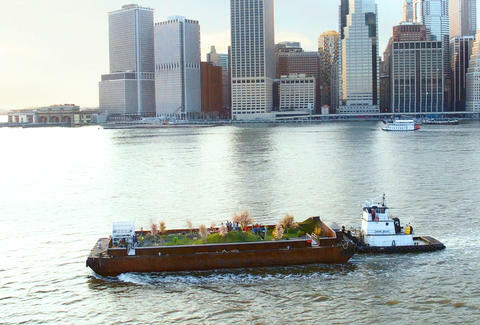 It’s a food forest, floating on New York City’s waterways, providing free fruits and vegetables to anyone who wants to come aboard. 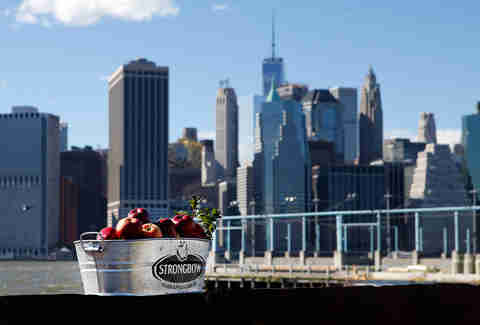 This year, Strongbow Hard Apple Ciders is partnering with Swale in an effort to inject pockets of nature into cities around the world, as part of the brand's Nature Remix campaign. It's thanks to this partnership that Swale will return to New York this summer -- and make a comeback with a completely new look. In addition to the edible and medicinal plants on board last year, eight apple trees have been planted on Swale -- officially making it a floating apple orchard. It will also be open to the public again in 2017, thanks to Strongbow’s involvement. In the summer of 2016, Mattingly, along with a team of artists, collaborators, supporters, and educators, launched Swale for the first time. It’s on a 130ft x 40ft hopper barge -- previously used to carry construction goods. 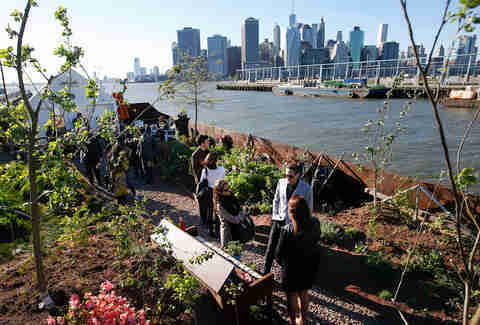 Instead of lugging lumber, though, it now carries hundreds of pounds of perennial edible plants along the Hudson River. It spends most of its time in the Bronx, Brooklyn, and Governor’s Island, while wintering at King Marine in Verplanck, NY. This isn’t just a community garden on the water though. It’s a food forest -- meaning that eventually, everything that grows on Swale will be practically self sustaining. The plants onboard (like strawberries, kale, and fennel) will come back stronger every year. With each passing season, there will be less need for volunteers to help water the plants, or make sure the soil has enough compost to support the fruit bearing edibles. Eventually, it will even look like a forest. What may be most interesting about Swale, though, is also that it’s a work of art -- but one you are encouraged to experience with all five senses. Initially, the project was funded thanks to kickstarter, but it’s also supported by Blade of Grass, an organization that provides resources to artistic works meant to inspire social change. Last year, when Swale was transported upstate for the winter, it’s future was actually uncertain, Mattingly says. There was a chance that Swale wouldn’t reopen in 2017 -- until Strongbow Hard Apple Ciders got involved. The partnership with Swale is part of Strongbow’s Nature Remix initiative -- a global program where they work to incorporate nature into cities in unexpected ways. 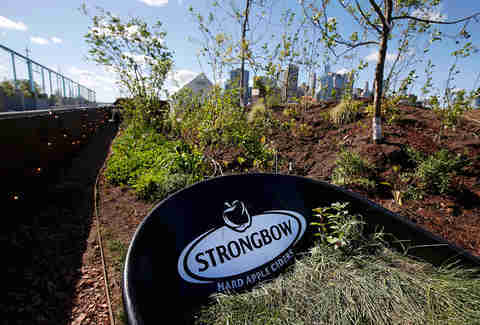 Thanks to Strongbow, Swale will not only provide a natural respite to greenery-deprived New Yorkers this summer. It will also have an entire apple orchard on board, providing free apples by the fall. Officially, you need five apple trees to call an area an apple orchard, and Swale has eight. 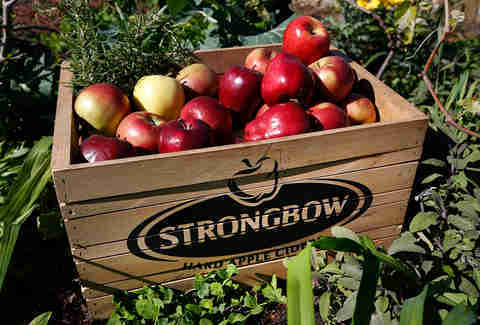 Strongbow’s partnered with at least seven other urban farms or natural spaces around the globe to not only establish urban orchards, but to help ensure these natural spaces aren’t closed due to a lack of funding. For example, in Johannesberg, South Africa, Strongbow tasked local gardeners with planting trees in a vacant spot in the city. They worked on similar projects in Toronto, Bucharest, Bratislava, Prague, Lisbon and Vietnam. Swale, however, is Strongbow’s first project in the United States. Swale isn’t the first project like this Mattingly has spearheaded. In 2009, she created Waterpod, a self-sustaining community for five artists in the Bronx. Like Swale, it was also on a barge, but the five completely lived off the space -- collecting rainwater, gathering eggs from the four chickens they brought on board, and eating the food they grew there. Mattingly was inspired to create Swale while she was living on Waterpod -- after members of the community asked why they weren’t growing more food onboard. With Swale, Mattingly wants people to think about food the same way they think about water. That means that instead of treating food like a commodity, able to be bought and traded, we would treat it like a public resource. Sort of like how there’s a public water fountain in every park. Having Swale on the water also connects it to water rights issues, another passion for Mattingly. She grew up in a farming town in New York State, where pesticides from the local farms made the water unsafe to drink. “Water rights has always been something that has been really important [for me] to address, in art work and in any way possible,” she says. For Strongbow, partnering with Swale was an important part of their mission to connect those who live in cities with nature. The reason they targeted cities, Robinson said, was because people who are surrounded by concrete jungles often lack open green spaces. Studies have shown that spending time in nature can help soothe stress, make you more attentive, and overall just a happier person -- but people in cities have a harder time reaping those benefits. Because Swale is on the water, it poses an interesting challenge: how, exactly, do you make sure there is enough soil and gravel for plants to grow, without the barge sinking? Then add a few dozen people, walkways, a greenhouse theater for events, and now -- a hill for apple trees to grow on. Managing the weight on the barge was one of the challenges tasked to Subhram Reddy, an engineer who leads the onsite operations on Swale. This winter, in particular, he had to rework Swale’s layout to accommodate a hill on board for the apple trees Strongbow provided. Every aspect of Swale was first weighed and laid out on a computer before a single seed was planted. For the plants to be able to retain some water, a level of gravel was needed underneath the soil and compost. Just one cubic yard of gravel, though, can weigh up to 3,000 pounds. To alleviate that, the team chose lava rock to act as a substrate. It weighs about half what traditional gravel does. Even so, each planter on board weighs between 250-300 pounds, and needed to be lifted on-board with heavy construction machinery. Now the artpiece accommodates 50 tons of soil, 10 tons of gravel, 15 tons of lava rock, and 200 edible perennial plant varieties. To create even a small hill onboard without significantly adding to Swale’s weight, Reddy looked to another unique substance: foam. To add the necessary height, about 18 inches of marine foam was cut and molded at the hill’s bottom center. Then, the team added layers of lava rock, soil, and compost to fill it out. Robinson was there when the hill was completed, and the apple trees were first planted. It was a freezing day this past winter when they finished the project and filmed Strongbow’s upcoming commercial that features Swale. “It was so cool seeing the transformation, from just dirt,” she said. "We wanted the forest to take over the barge"
Just because Swale will eventually become self-sustaining, doesn’t mean the plants onboard don’t need some TLC. Because they’re young, they still need some maintenance, not unlike a regular garden. They need to be watered when there isn’t enough rainfall and pathways need to be kept clear from weeds. Compost has to be added to the soil to make sure the plants have enough nutrients. Because Swale is located on the saltwaters of New York City’s waterways, Mattingly also needed to shield the plants from sea spray -- which could dehydrate them. To protect them, she lined the perimeter with edible plants that could endure getting a little salty, like sea kale. It looks like cabbage, but grows near the beaches along the North Atlantic. They also had to make sure there was no water run-off from Swale, which could potentially harm the ecosystems in the Hudson and East River. So, Mattingly’s team designed the center of Swale to act like a marsh, collecting as much rainwater and runoff as possible, which then gets reused. Pollinators, like bees, also are vital to making sure edible plants produce fruit. But, because there is no reason for bees to venture over the Hudson, Mattingly and the team had to bring them onto Swale. To do that, an old piano was re-engineered into a beehive in 2016. This year, pollinator flowers were brought on board. Swale was docked at Verplanck for the winter, the same place they built the food forest originally -- and where Strongbow helped the team rebuild Swale this past winter. 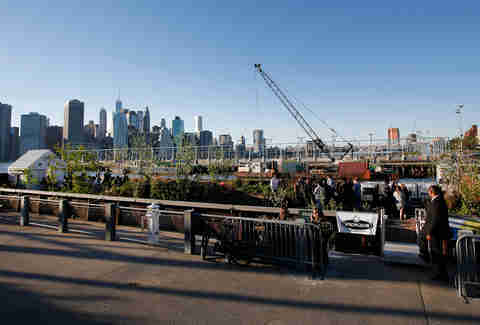 This summer, it will be docked at Brooklyn Bridge Park’s Pier 6 through June 30. 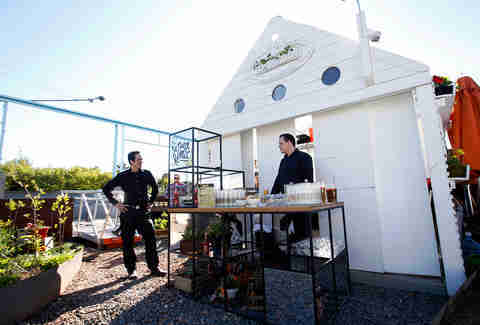 Then it sets sail for the Bronx's Concrete Plant Park until September 5, before watching summer turn to autumn at another dock still to be determined. Eventually, Mattingly wants to find Swale a permanent home, and bring the food forest concept on land. Right now, foraging in any NYC park is actually illegal. That could change though, as the Parks Department, along with the Youth Ministries for Peace and Justice, are already in discussions about creating a “foodway” in the Bronx. Thanks in large part to Swale. The Hunts Point area of the Bronx is actually home to the largest food distribution center in the world, and is where most commercial grocery stores get their food. However, the area surrounding the distribution area is actually a food desert -- meaning that residents don’t have adequate access to healthy, whole foods. A public foodway could help change that, says Dariella Rodriquez, director of community organizing and outreach for YMPJ. She, along with the people at YMPJ, helped build Swale and program it with Mattingly. Rodriquez worked with Mattingly and youth at YMPJ to lead tours on Swale, to set up events, and to educate the community about the food forest and the importance of good nutrition last year. “A lot of people in the beginning were confused and amazed and curious,” she says of Swale, including some of the youth docents. Ingredients like bok choy or tomatillos, which grow on Swale, were something they had never encountered. If you can’t get out to Brooklyn or the Bronx this summer, Strongbow will be handing out seed coasters at events across the country. Basil seeds are embedded into the coaster, which is completely biodegradable. All you need to do is plant it in some soil, then keep it watered and sunny to bring a tiny piece of nature into your place, no matter where that is.